A battle-damaged Federation Corvette transport model miniature spaceship from Paul Verhoeven’s 1997 sci-fi action film Starship Troopers. The cornerstone of the Federation fleet, UCF Corvettes came under heavy attack during the failed invasion of Klendathu. Upon returning to the battlestation Ticonderoga, the full extent of the destruction wrought upon the fleet by the alien “arachnids” was revealed. 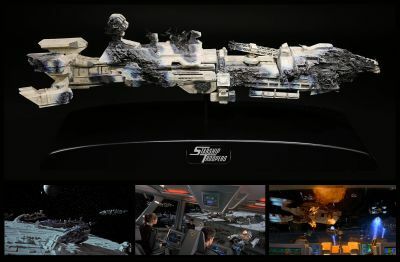 Constructed by Sony Pictures Imageworks’ Thunderstone model shop, this highly detailed mid-size miniature is made from cast resin components, with additional resin and styrene detailing to bring the engine nacelles, communications tower, bridge, gun turrets and fighter-deck scaffolds to life. Fibre-optic strands are still present; these illuminate ‘windows’ when lit. Plasma damage is applied to the hull of the vessel, with burned bulkheads revealing open decks and compartments. Additional burn marks are hand-painted on the hull in purple, marring the battleship’s grey finish. The model includes two interchangeable hull sections which allowed the ship to be used several times as different vessels during the Ticonderoga sequences. A support beam is fixed to the base of the ship, where it was likely mounted during production, and sits on a custom-made display stand.